Germany’s 2018/19 Bundesliga campaign kicked off on Friday as Bayern Munich took on TSG Hoffenheim. It was a match full of goals and VAR drama – all the things that we have grown to love about the league – and while some things never change – yes, Bayern Munich did win their opening match (shock) – there were plenty of stories to get you talking. Borussia Dortmund look to be doing alright for goals in a post-Aubameyang and -Batshuayi era, runners up Schalke were given a run for their money against a rejuvinated Wolfsburg, newly promoted Fortuna Dusseldorf and Nurnberg opened their top flight campaigns with defeat, and there may be a fairytale in the making at Hannover 96. Below we take a look at some of the hot topics being talked about following the Bundesliga 2018/19 opening weekend. When Borussia Dortmund went 1-0 behind to RB Leipzig after just 30 seconds on Sunday, many must have thought ‘here we go again’. Dortmund cost themselves so many points last season thanks to sloppy defending, but it just goes to show that we shouldn’t jump to conclusions. While the game was all Leipzig for the first quarter of an hour, it didn’t take long for Lucien Favre’s men to adjust and get themselves back into the game via a stunning heading from Mahmoud Dahoud in the 20th minute (see video above). Dortmund’s goals and acrobatics didn’t stop there though. Der BVB found themselves 3-1 up going into half-time thanks to the overhead kick from short range from Belgian newcomer Axel Witsel. He now has two to his name at Dortmund after saving them in the dying minutes of their DFB Pokal round one match against Greuther Furth – he could prove to be the Bundesliga signing of the summer. Marco Reus’s goal to make it 4-1 late on saw Dortmund move top of the Bundesliga on goal difference. Even after winning a sixth consecutive title, Bayern Munich looked hungry for more in the 18/19 Bundesliga opener against TSG Hoffenheim last Friday, with new manager Niko Kovac taking the wheel for his first league match in charge at the club. Thomas Muller opened the scoring – this is the third time he has scored the opening goal of a Bundesliga season – but it took a penalty from 17/18 top scorer Robert Lewandowski to pull them ahead again after Hoffenheim drew level – the first major use of VAR for the new season (retaken penalty). After another, this time more controversial, VAR decision (goal disallowed), a goal in the 90th minute from Arjen Robben eventually sealed a 3-1 win for the reigning champions. However, the celebrations were tainted by one particular incident – the injury sustained by Bayern winger Kingsley Coman just before half time. Another rupture to the syndesmosis on his left ankle – the same injury that ruled him out for the second half of last season – means he has to undergo surgery. He’ll miss a few weeks of football at a minimum. Wolfsburg maintained their top flight status via the relegation play-off for a second consecutive time last season, so hosting the 17/18 runners up Schalke 04 in their opener was always going to be a tough fixture – if not only for the fact that the Wolves had one of the worst home records last term. Investment over the summer does, however, show that the Wolves are trying to make it third time lucky, and a promising performance saw them the superior side for long stretches of the match. Nevertheless, Schalke proved a tough team to break down – even when they were down to 10 men in the 65th minute – and it was only in added time where the Wolves were able to brake the deadlock. Newly signed striker Daniel Ginczek (from Stuttgart) was brought on for the last 15 minutes and he started his season in perfect fashion by scoring the winner to make it 2-1 to Wolfsburg with the last kick of the game. Read More: Is the Premier League really the most competitive league in Europe? Borussia Monchengladbach were another team with a tough opener, hosting the first ‘Rhein derby’ of the season against Heiko Herrlich’s Bayer Leverkusen. Leverkusen started out the better side – one chance for Kevin Volland in particular should have seen them ahead – and when Gladbach’s Thorgan Hazard failed to covert a penalty in the 37th minute, you might have expected the game to continue that way. Whatever Dieter Hecking said to them at the break did wonders. Gladbach started the second half more dangerous and won a second spot kick from a mistimed tackle from Leverkusen defender Dragovic, who was on loan at Leicester last season. Jonas Hofmann was able to do what Hazard was not and put the hosts 1-0 up. Just three minutes later, Raffael and Fabian Johnson combined with some impressive back and forth teamwork to pass their way through a handful of defenders and put the ball in the back of the net for 2-0. Bragging rights belong to Borussia. Look over the goalscorers on the opening Bundesliga weekend and you see plenty of familiar names: Lewandowski, Robben and Muller were all on target for Bayern Munich, Ibisevic struck at home for Hertha Berlin, Marco Reus is continuing where he left off for Dortmund, Daniel Ginczek and Andre Hahn helped Wolfsburg and Augsburg to winning starts, but one name on the list comes as a surprise: Hendrik Weydandt. Hannover’s new signing came on in the 75th-minute and scored the only goal in their 1-1 draw away to North German neighbours Werder Bremen… but what’s so special? Weydandt was playing at an amateur level before he signed for fourth tier side Germania Egestorfin in 2014. Hannover brought him in over the summer to strengthen their reserve team, but head coach Andre Breitenreiter had other ideas for the forward after he caught his eye in pre-season training. From the seventh tier to the Bundesliga, Weydandt is proof of where hard work can get you, and that it is never too late to realise your dreams. Will he get to live out a German version of the Jamie Vardy story? Only time will tell. Categories: Blog and Football. 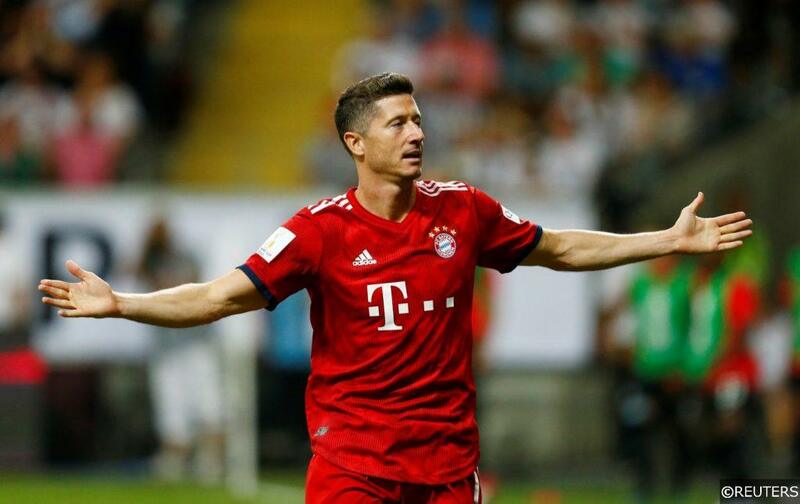 Tags: Bundesliga, Bundesliga Betting Tips, Bundesliga Match Previews, German Bundesliga, Marco Reus, and Robert Lewandowski. Team Tag: Bayer Leverkusen, bayern munich, Borussia Dortmund, Borussia Monchengladbach, BVB, hannover 96, rb leipzig, Schalke, TSG Hoffenheim, Werder Bremen, and Wolfsburg. League: German Bundesliga. Sports: Football.